Posted by Angela Steffi on 9:46:00 PM Potato smiley is an all time favorite recipe enjoyed by all ages of people, especially very famous among kids. This recipe is quite simple and very easy to make , all we need is boiled potatoes and some seasoning. 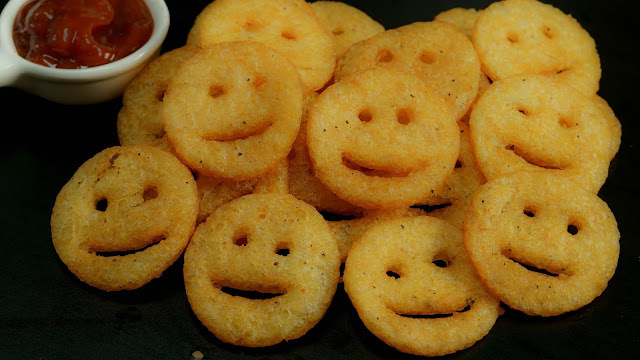 The crispy smileys with their beautiful smile brings smile to our face and will make to crave for more. Lets see how to make this crispy potato smiles. Step 1) Boil and grate 4 medium sized potatoes, we can also smash the potatoes but for even size i would recommend to grate the potatoes after boiling. Step 2) Season the grated potatoes with salt, pepper, chili powder, corn flour and bread crumbs. If you dont have bread crumbs then grind 1 bread slice in a mixie and add it to the potatoes. Without adding water knead it into a dough, If you feel the dough is watery or sticky then add little more bread crumbs or corn flour to make it thick. Step 3) Grease the broad and rolling pin with oil and roll the dough thin (about 1/2 cm in thickness). Then with a sharp edge of a lid press it down to cut circles. Then with a straw make 2 holes for the eyes and with a edge of a spoon make a cure for the beautiful smile. Again roll the leftover dough and make more smilies. Step 4) Once the oil is nice and hot add the smiley one by one and fry until crispy and golden. Enjoy this crispy delicious smiley with a smile on your face. Wow! I tried this today; since i'm a beginner and first time for cooking, i found it little difficult but wow it was nice :) Thanks and best wishes for pursuing your passion. Thank you so much for your feedback. All the best for your cooking journey !! Seems yummy. My son is fond of it. Should try.